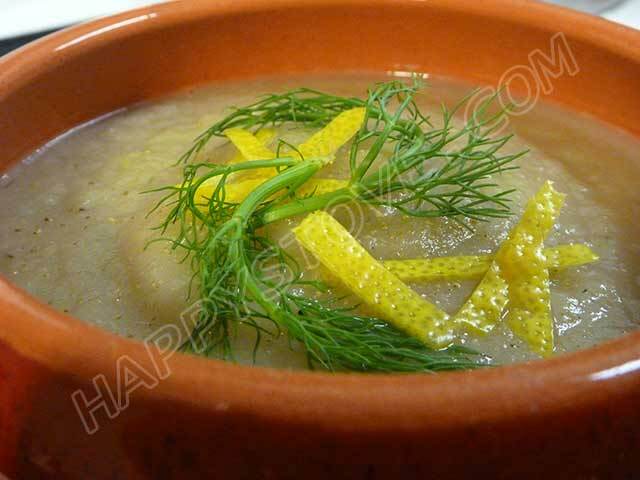 Cream of Fennel Soup is a fancy dish, not so difficult to prepare. A recipe that will win you over with its great union of flavors: the fennel, the anchovies and the lemon zest blend together in this fantastic and creamy soup. There's nothing better to eat than one warm soup when the cold season is coming. Before starting, boil the potatoes. In the meantime, wash and clean the fennel. Cut in thin slices the white part. Save some leaves for later (the green ones that look very similar to fresh dill). In a large pot, stir fry the onions in the oil until caramelized. Add the anchovies and the fennel thin slices. Stir well and saute for 2-3 minutes. Add the grated zest of half lemon and, to follow, add two cups of the broth and two cups of water. Mix well and cook on medium-low heat, covered, for about 25 minutes or until soft and ready. Remember to stir from time to time. Add to the soup the boiled and peeled potatoes cut in pieces. Using an immersion blender reduce the soup in a creamy puree. Season with white peppercorns and salt and cook at very low heat for few more minutes or until ready, stirring continuously. This Cream of Fennel Soup should be creamy but not too thick, the texture should resemble a chowder. Transfer in serving bowls and garnish with the remaining fennel leaves and some finely shredded lemon peel before serving. Instead of an immersion blender you can use a regular blender, let cool the soup before blending and then reheat a bit. Add more water or broth if necessary. If you like better you can blend only partially the fennel and the potatoes, leaving some chunks in your soup. You can also serve your cream of fennel soup with a sprinkle of extra virgin olive oil, freshly ground white peppercorns and with some croûtons. Another idea for a yummy variation is to substitute lemon zest with orange zest. For an extra kick, try adding some fresh mint leaves. Instead of vegetable broth you can use either fish or beef stock. Alternatively you can use bouillons and water . To save washing one extra pot you can wash, peel and cook the potatoes in small pieces directly in the soup: just add more water if necessary. Fresh Tomatoes, Anchovies and Capers Spaghetti is a great recipe for a summer dinner. Enjoy the freshness of the tomatoes and the spicy and flavored taste of anchovies and capers in this absolutely wonderful pasta.